One of the first tasks in developing output for your project is to determine which type of output is most appropriate for your needs. You might even need to produce multiple outputs and require more than one output type. There is a fine line between what is called "online output" and what is called "print-based output." 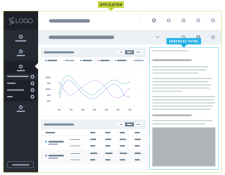 The truth is that topics in virtually any of Flare's online output types can be sent to a printer, and therefore considered print-based. Similarly, any of the print-based output types can be viewed electronically, and therefore considered online. The real distinction between online and print-based outputs has to do with their primary purpose. Online outputs are usually intended to be viewed on a screen, rather than on a printed page. The idea is to show only small pieces of content at a time and allow users to jump around to other topics or elements of the output. On the other hand, print-based output follows a more traditional format that you would find in an actual book or manual—with the pieces of the output following one after the other on pages until the end of the book (e.g., title page, table of contents, preface, chapters, index, appendixes—with page numbers, as well as header or footer content, shown along the way). Then there is EPUB output, which is intended to be viewed on a screen, but follows a structure closer to print-based outputs. HTML5 is the recommended online format in Flare. This output type supports the HTML5 specification developed by the World Wide Web Consortium (http://w3.org) and the Web Hypertext Application Technology Working Group (http://whatwg.org). Therefore, the HTML5 format results in better markup and offers additional features not found in the older WebHelp outputs in Flare. The HTML5 output consists of a collection of files that you will distribute to users. The output will be displayed in the user's Internet browser window. The main entry file has an .htm extension. Flare's online Help was created with HTML5. Because HTML5 output is quite different from the other online formats, it requires its own skin. In fact, you have more than one skin from which to choose. See About Skins. One popular option is the Side Navigation skin, in which the main navigation is positioned at the left or right. This allows you to use a flexible, frameless output while continuing to have a more traditional configuration that looks like the Tripane format. See HTML5 Side Navigation Output. Then there is the Top Navigation skin. This lets you generate a flexible, frameless output like a modern website, with the main navigation items at the top of the screen. See HTML5 Top Navigation Output. Another alternative is to use a Tripane skin, which lets you generate output in a traditional format with three distinct frames (a navigation pane on the left, a toolbar and search on the top, and the main body pane). See HTML5 Tripane Output. You can even tell Flare not to use any skin at all for HTML5 output. In this situation, you would rely on proxies or links inserted directly into your content, or you would have no links or navigation at all. See HTML5 Skinless Output. You can also use smaller skin components that work with related proxies. 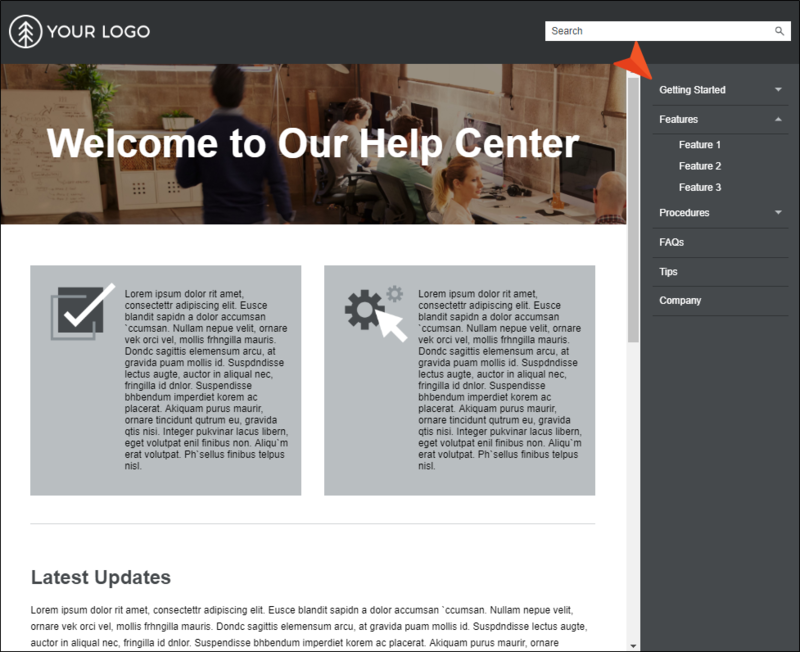 With these, you can add and design menus and toolbars, inserting them in your content anywhere you like. For Side Navigation, Top Navigation, and skinless outputs , you can also create search bars and customized results pages. See Skin Components and Proxies. Note: If you want to translate interface elements in an HTML5 skin, you can do this using a language skin or using the UI Text tab located in the Skin Editor. This tab lets you perform all of the localization tasks that you would normally accomplish in a language skin. Be aware that translations in the Skin Editor are prioritized over translations in a language skin, so you should try to perform your localization tasks in one place to avoid conflicts. See Changing Text Strings in HTML5 Skins. Pages in HTML5 output do not use <frameset> or <frame> tags, like they do in regular WebHelp output. In addition, HTML5 Side and Top Navigation outputs are completely frameless, meaning they also do not contain iframes. This means that output is much easier for web crawlers to find, thus improving search engine results. Note: If your HTML5 output is enabled with MadCap Pulse, the comments area at the bottom of topics is wrapped in an iframe. Therefore, the output is technically not entirely frameless. However, because it is only the comments that are contained in the iframe, the main topic content still retains the benefits (e.g., better search results) of frameless output. Responsive web design (RWD) is a way to construct your HTML5 output so that the display is adjusted automatically depending on the device. Therefore, on tablets and smart phones, users will see a condensed look that is more appropriate for those devices, compared with larger monitors. You can get the same effect if you shrink your browser to a smaller size. Responsiveness is automatically built in to HTML5 skins. See About Responsive Web Design and Responsive Skins. 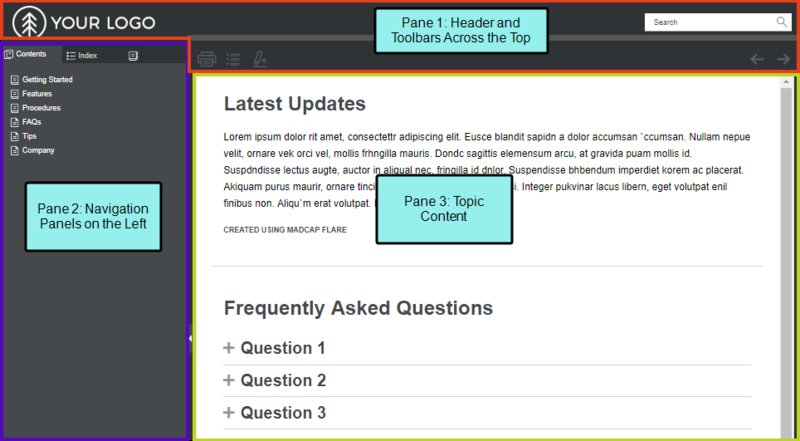 Styles and media queries can be used to make your content responsive in HTML5 output. This lets you present information—both its substance and structure—differently depending on the size of the screen or device. Flare provides a Responsive Layout window pane that helps you create this kind of content more easily. You also have the option of using third-party solutions (most notably the Zurb Foundation grid system) by adding the appropriate styles in your stylesheets and topics. See About Responsive Web Design and Responsive Content. With the regular WebHelp output, you can only give readers a single URL path, which opens the starting page for the output. With HTML5 output, you can point end users to a specific page in the output by giving them the exact URL path. Because HTML5 output also allows for pagination in search results, you can also direct users to specific page addresses in search results. Let's say you generate regular WebHelp output, with the primary output file called "MyOutput.htm." When you view the output with the initial topic shown (say it's called "Welcome.htm"), the URL path in the browser might look something like this. And if you then click on another topic (say, "WhatsNew.htm"), the same URL path will be shown. It does not change, even though you opened a different page. On the other hand, suppose you generate HTML5 output. The URL in the browser may look the same as the path for regular WebHelp when the output is first displayed. But if you click on the "WhatsNew.htm" page, the URL will change to this. And if you click on the "Welcome.htm" page to return to it, the URL will change to this. For HTML5 targets, you can choose the type of search engine you want people to use—MadCap Search, Google Search, or Elasticsearch (for Side Navigation, Top Navigation, or skinless output). There are additional steps that you can follow and features you can select, depending on the search engine you choose. For MadCap Search and Elasticsearch, you can include micro content in the output, which can especially enhance your search results. See Setting Up a Search Engine. For web-based targets, you can generate a sitemap when compiling your output. This helps with search engine optimization (SEO), making it easier for search indexing services (i.e., spiders, crawlers, or bots) to find your output. Therefore, the entire output is indexed and search engine results are improved. See Generating Sitemaps for Search Engine Optimization. 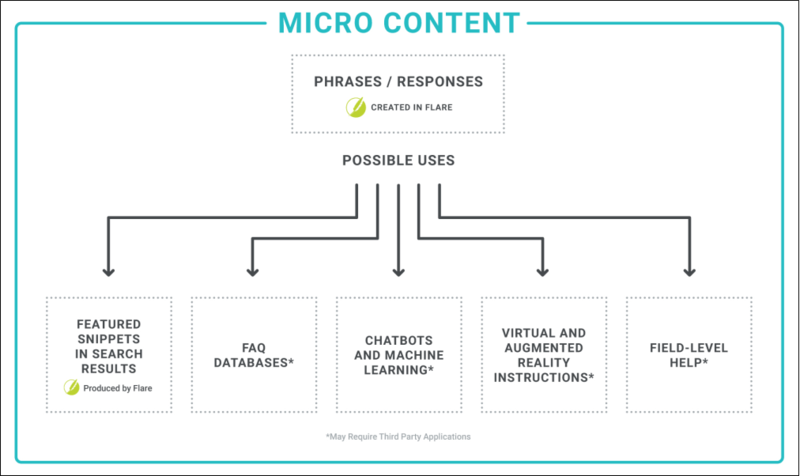 Micro content is what it sounds like—short, concise information that stands alone and is easily consumable. In Flare, it begins with the creation of a collection of brief phrases and corresponding responses, such as questions and answers. After generating HTML5 output, these phrase/response combinations can be used in different ways as users interact with your output. Among other benefits, it can greatly improve the user experience when people search in your HTML5 output. See About Micro Content. 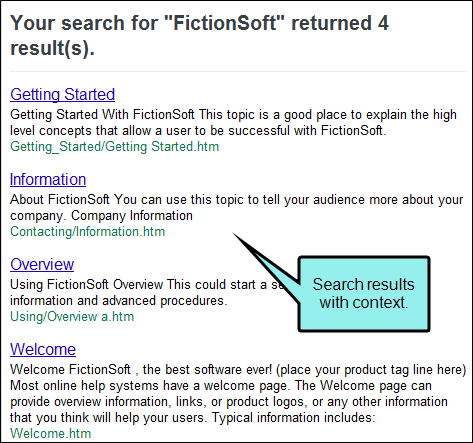 If end users perform a search in your output, they will see context next to each result, rather than terms only. In addition, you can create topic meta descriptions, which will be used in the search results abstract. Also, the meta description itself is searchable. See Adding Meta Descriptions for Topics. 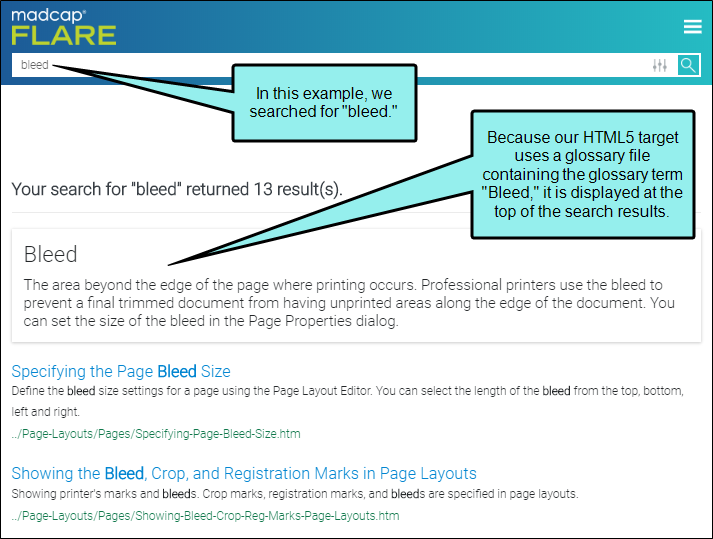 For HTML5 output, search results display glossary terms if they are used as the search text. This option to display glossary terms in search results is enabled by default. However, it can be turned off in the HTML5 Target Editor. See Including Glossary Terms in Search Results. Features such as drop-down text, expanding text, and popups have a smoother appearance when they are activated. You can create HTML5 output in its regular state, or you can select an option in the Publishing tab of the Target Editor to enable server-based functionality. This allows you to accomplish the same results as WebHelp Plus output—searching of non-XHTML content, server-side search, and automatic runtime merging.See Enabling HTML5 Server-based Output. Multiple Platforms You can publish to a machine running Windows Server 2003, Windows Server 2008, or Windows 7. Searching of Non-XHTML Content When end users perform a search in your online output, you can ensure that non-XHTML files (e.g. PDF, DOC, XLS) are included in that search. When you build WebHelp Plus or HTML5 server-based output, a subfolder named "AutoSearch" is created and placed in the generated output folder. You can place non-XHTML files within the published AutoSearch subfolder (whether the non-XHTML files are linked to content from your Flare project or not). When users perform a search, those non-XHTML files will also be accessible to the users. See Including Non-XHTML Files in HTML5 Search. Microsoft IIS Search Engine Another benefit of generating and publishing HTML5 output to a web server is that it takes advantage of Microsoft's IIS search engine to help power your search. This is especially useful if you have a very large Help system. Automatic Runtime Merging of Flare Projects This is an easy way to merge the output from multiple HTML5 server-based Flare targets into one Help system. These targets can be originated from the same Flare project or from different Flare projects. You simply place the output files in the correct location on the server (i.e., within your master project's AutoMerge folder). Flare then automatically merges the output from all of the targets when users access the Help. From the end user's perspective, the results are seamless, appearing as one large Help system. All of the TOCs, browse sequences, indexes, glossaries, and search capabilities for the projects are merged.See Runtime Merging Server-based HTML5 Output. 1If your HTML5 output is enabled with MadCap Pulse, the comments area at the bottom of topics is wrapped in an iframe. Therefore, the output is technically not entirely frameless. However, because it is only the comments that are contained in the iframe, the main topic content still retains the benefits (e.g., better search results) of frameless output. Flare offers several print-based output types, but the two recommended above the others are PDF and Word. Following are overviews of each of these. Short for "Portable Document Format," PDF is an open standard format for electronic documentation exchange invented by Adobe. PDF files are used to represent a two-dimensional document in an device- and resolution-independent fixed-layout format. You can generate PDF output from your project directly, or you can generate a PDF while simultaneously building Word output. You can also set PDF options in the Target Editor. These options let you specify the way that images, document properties, the initial view, and security are handled in the output. See Specifying PDF Options. PDF output consists of a file with a .pdf extension that you can print or distribute to users. Word is an output type where the generated project is exported to Microsoft Word in one of the following formats: XML (default), DOC, DOCX, XPS, PDF. However, you can also create PDF output directly, without going through Word. If you track changes in your topics for review purposes, you can preserve these changes in Word output. See Preserving Tracked Changes in PDF or Word Output. 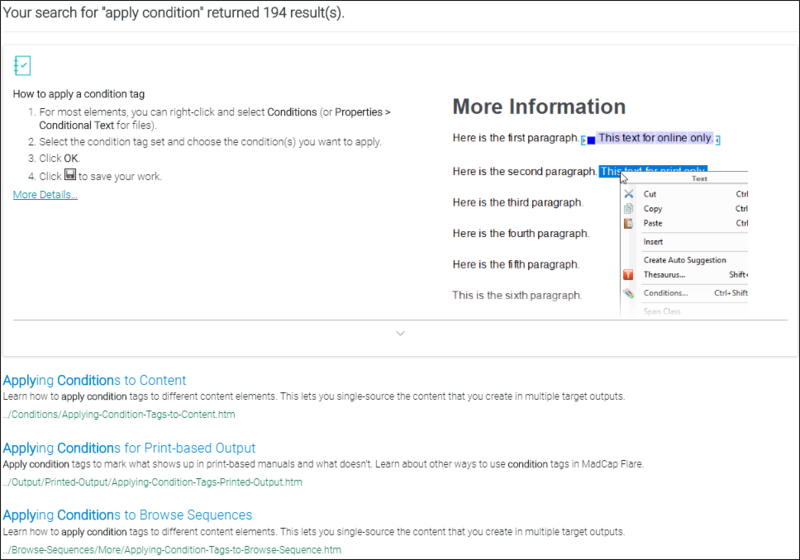 Note: For Word output, you can use master pages or page layouts to control the configuration of pages in the output. If you use page layouts (which are recommended), you can select an option in the Page Layout Editor that shows the real header, footer, and body areas if the page layout will be used in Microsoft Word output. See Showing the Word Overlay in Page Layouts. Note: Unless you specify otherwise, the Word target will create files with an .xml extension only. If you want to use one of the other formats see Specifying DOCX Output Via Microsoft Word, Specifying XPS Output Via Microsoft Word, and Specifying PDF Output Via Word. Note: Flare supports Microsoft Word 2003 and newer versions. Note: To create output in DOCX or XPS format, you need to have at least Microsoft Word 2007 installed. Also, Word 2007 allows you to create PDF files from Word without needing to have the Adobe Distiller installed. Following are overviews of additional output types that are somewhat unique. 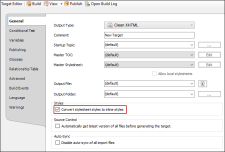 Clean XHTML produces basic HTML files that are free of MadCap-specific tags and not dependent upon other MadCap-generated files. The output does not include any skins, search, navigation, or other extra features; it is simply your single-sourced content. This allows you to re-purpose your output in many flexible ways (e.g., you can embed the output files into other applications, such as project management tools, wikis, or eLearning systems). You might also perform other types of post-processing tasks with the output. 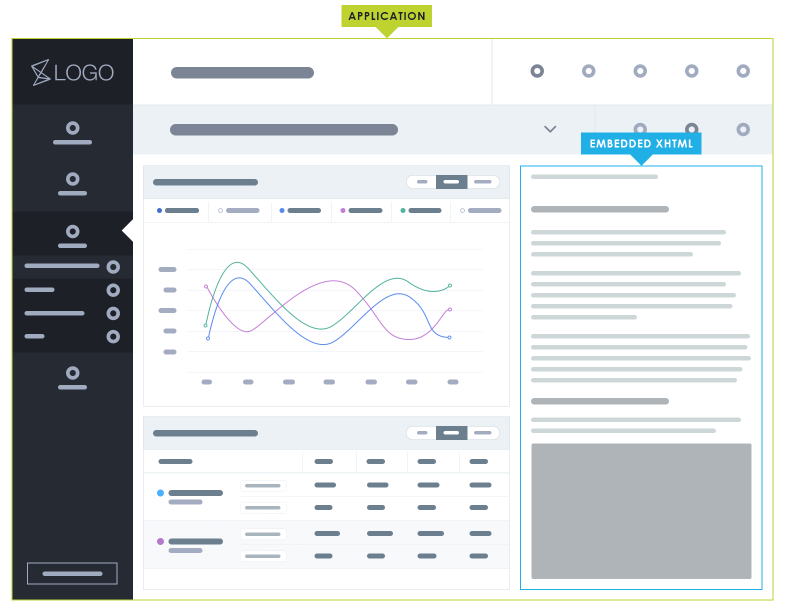 Single-Sourcing Flare’s unique features are applied during compilation so that you still end up with single-sourced output. MC Tags All mc tags and data-mc tags are removed, including keywords, concepts, conditions, etc. Note: The MC tags that are removed for Clean XHTML output are related to MadCap-specific features, such as drop-downs and cross-references. Although these tags are removed from the output, the generated style classes that start with “MC” are preserved, because they are needed to support these MadCap-specific features. Therefore, these style classes are converted during the build, and they are defined in the generated MadCap.css file. Namespace The MadCap namespace is removed. Images/Multimedia Images and other multimedia remain as separate files in the output and are included in the topics by reference. MadCap Styles All MadCap-specific styles are removed from the user stylesheet. 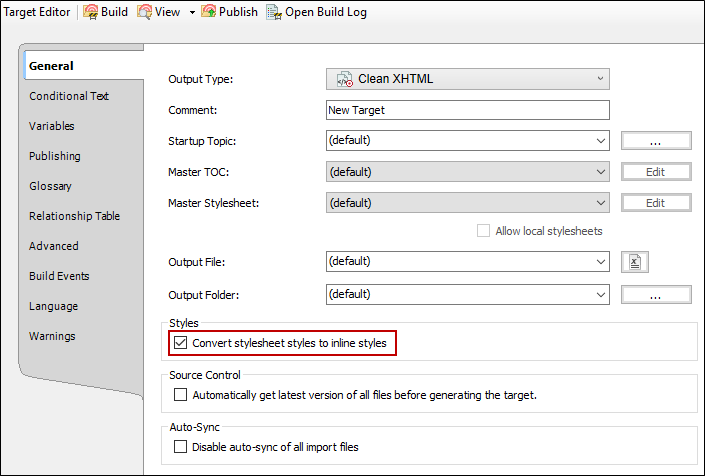 Convert to Inline Styles In the Target Editor (General tab), there is an option to convert stylesheet styles to inline styles. If you choose this option, the output folder will not include stylesheet files. That’s because the styles have been integrated into the topic files. Darwin Information Typing Architecture (DITA) file content is supported in Flare. DITA is an XML-based markup language with its own schema for authoring, producing, and delivering technical information. It is a standard of the Organization for the Advancement of Structured Information Standards (OASIS), and it consists of a set of design principles for creating "information-typed" modules at a topic level and for using that content in various delivery modes. DITA allows companies (especially larger ones) to maintain better consistency throughout its documentation by establishing structural rules and standards for all of its authors to follow. The idea is that writers will spend more of their time authoring content, rather than worrying about the presentation of that information. In Flare you can generate output that produces DITA files. When you build this type of output, a DITA map file is generated, with multiple DITA files in it. The XHTML tags are converted to DITA elements. In other words, although it is considered an "output" from the standpoint of the Flare process, the end result is actually a collection of "source" files, which you can later use in another tool (or import back into Flare) to produce the final output. The Eclipse Help output lets you generate Eclipse Help plug-ins using your Flare content as its source material. It displays your output content in the Eclipse Help Viewer. The Eclipse Help Viewer uses an embedded Jetty server to provide your users with navigation features similar to other online viewers. Jetty is a Java-based web server implementation that tightly integrates with Eclipse and other open source projects. The viewer's features and user interface must be customized in Eclipse. To learn about your customization options, visit this link: http://help.eclipse.org/kepler/index.jsp. Plug-In XML File This is an XML-based main file that defines the name and ID of the Eclipse help plug-in that you generate with Flare. HTML Content Files As with other output types, Flare publishes a separate HTML file for each documentation topic. These are contained in the Content folder. 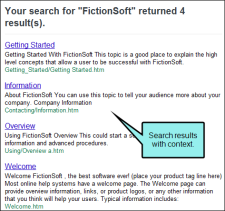 Other XML Files Flare publishes separate XML files for the table of contents, keyword index, and context-sensitive Help . These correspond to the org.eclipse.help.toc, org.eclipse.help.index, and org.eclipse.help.contexts extension points. Manifest.MF File The manifest file is used only when you package your Eclipse help plug-in as a Java archive (JAR) file. This file is required by Java when creating a JAR file. If you package your Eclipse help plug-in as a JAR file, the META-INF folder contains the required Manifest.MF file. 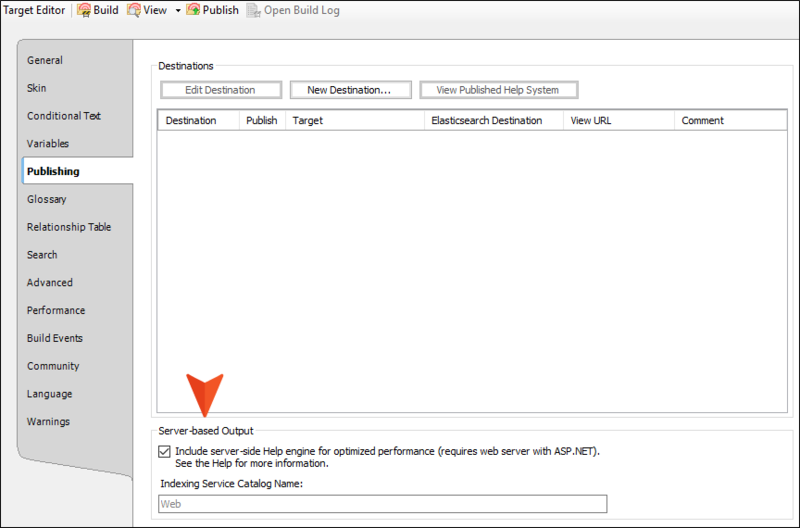 Eclipse Help Plug-In and Extension Points This output type is particularly useful when you want to create dynamic, searchable content that integrates into the Eclipse workbench as a platform plug-in. 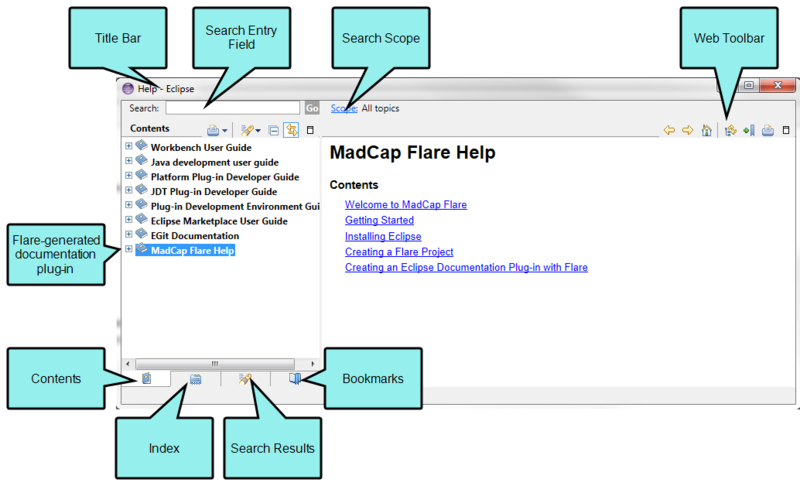 Flare generates an XML-based plug-in file (plugin.xml) that specifies the context Help (csh.xml), index (index.xml), and table of contents (toc.xml) files that Eclipse needs to load your Flare content in the Eclipse Help system. Eclipse Help Viewer and Dynamic Help Window You can generate the Eclipse Help output for viewing with the Eclipse Help Viewer and the Eclipse Dynamic Help window, which displays context-sensitive Help and search results. Distribute Server-based or Local Content Your Eclipse content can be distributed over the web via an Eclipse InfoCenter server or on local systems with a pared down version of Eclipse, which provides the search capabilities and skin for the Eclipse Help Viewer. Publish Content as a Collection of Files or Single JAR File This format lets you publish the output for the Eclipse Help plug-in as a series of files in a folder or bundled in a single Java archive (JAR) file. As the individual compiling the output, you need to install the required Java Runtime Environment (JRE), which is part of the "Eclipse IDE for Java EE Developers" download. See Creating an Eclipse Help Plug-In. As the individual compiling the output, you must download and install the Java Version 7 (Update 45) or later on your Windows operating system. See Creating an Eclipse Help Plug-In. Note: Eclipse provides its own breadcrumb and topic toolbar support. See the Platform Plug-in Developer Guide from Eclipse at: http://help.eclipse.org/kepler/index.jsp. Note: If your Eclipse Help target contains non-web safe images (e.g., WMF, EMF, BMP, TIF, TIFF), be sure to select Generate "web-safe"images in the Advanced tab of the Target Editor. See Generating Web-Safe Images. Note: The Eclipse Viewer cannot display PDFs opened from links such as those in TOCs. Note: When you create a TOC intended for Eclipse output, you should make sure all items are linked. Unlinked items may not display in the output. Note: Eclipse does not use the Flare skin, so there will be no glossary pane in the output. However, you can insert a Glossary proxy (which is normally used for print-based outputs) as an alternative. 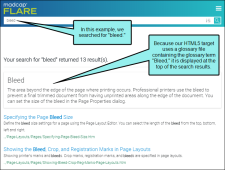 See Creating a Glossary Manually for Print. Note: Java bits and Eclipse bits must match in order to view Eclipse output in Flare. For example, Java 64-bit and Eclipse 64-bit must both be used/installed. EPUB is an online format for creating reflowable digital books (ebooks). This format is developed and maintained by the International Digital Publishing Forum (IDPF). For additional information about this group and the EPUB format, see http://idpf.org/. EPUB is sort of a hybrid format. The output is designed to be viewed electronically; in that way, it is like an online format. On the other hand, its structure is like a book or manual; in that way, it is like a print-based format. In fact, you can follow many of the same steps for creating PDF output to produce EPUB output. See Creating Print-based Output. Reflowable EPUB output allows for reflowable content, such as word wrap and resizeable text. Therefore, the content can be displayed optimally on different devices. Single File You only need to distribute a single EPUB file, rather than a collection of files and folders. Note: If you extract the EPUB file using another tool, you will find that it contains one or more XHTML files. If you have used chapter breaks in the outline TOC (see Specifying Chapter and Page Layout Breaks), a new XHTML file is created at each point where a chapter break occurs. If you do not use chapter breaks, the EPUB contains just one XHTML file. Embedded Metadata In the EPUB target you can provide information such as a title, author, publisher, rights, ISBN, identifier, which become embedded in the final output. 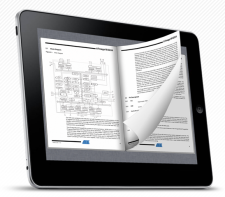 The document title you provide will usually be displayed at the top of the EPUB reader. If you do not provide a title, the target name will automatically be used instead. See Specifying EPUB Options. Embedded Fonts Flare includes all of your used fonts in the final EPUB output file. Therefore, if someone has a reader that does not have your fonts installed, that person will still be able to see your content as you designed it. Cover Page You can use the Target Editor to quickly and easily select an image file to be used as the cover for your ebook. See Specifying EPUB Options. Validate EPUB Output You can validate EPUB output so that it will be acceptable to most online stores, such as amazon.com. See Specifying EPUB Options. MOBI Output MOBI is the standard format used for the Amazon Kindle. You can use settings in the Target Editor in Flare to generate EPUB output that uses MOBI content. See Specifying EPUB Options. MathML to PNG Conversion If you use the Equation Editor to insert equations, you are in essence creating MathML markup (see About Equations). This type of content is supported for EPUB output. If you need to produce output that can be displayed on older readers, you can select an option in the Target Editor to convert all of your MathML content to PNG image files. See Specifying EPUB Options. Enable or Disable Dynamic Content Per Target If you use dynamic content—togglers, popups, drop-downs, expanding text, slideshows, or help controls—in your output, you may want to enable dynamic content for your EPUB target so your users can take advantage of these features. Likewise, you may want to disable dynamic content if your users are using an e-reader that does not fully support dynamic content. See Specifying EPUB Options. Select Reader to View Output From the Builds window pane, you can select a specific EPUB reader (if you have more than one installed) to view the output. See Viewing Output. Important: Some readers handle EPUB output and respect your formatting better than others. 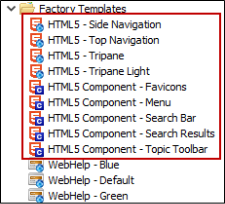 Although HTML5 is the recommended online output type, there is an older online output type called "HTML Help" that is also supported in Flare. 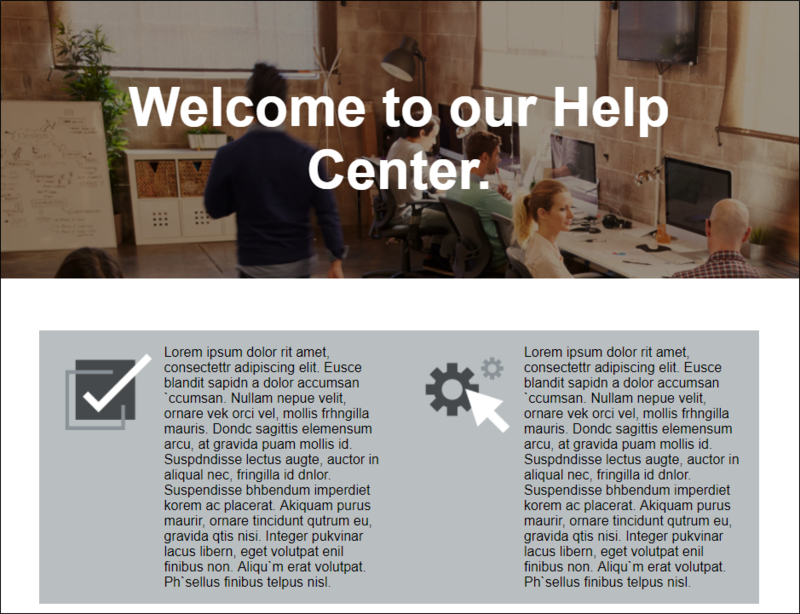 Microsoft HTML Help is an HTML-based Help format that runs on Windows 32-bit platforms and requires Internet Explorer on the end users' systems. 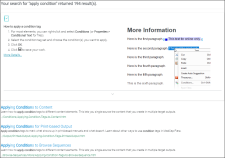 You can use Microsoft HTML Help to create Help for Windows desktop applications. The Microsoft HTML Help output consists of a single CHM file that you will distribute to users. Local This format is a good choice if you want users to store and open the output locally, rather than from a server, such as a website. Single File This format is a good choice if you want to create output that has just one file. Note: Your users need Internet Explorer (4.0 or later) installed and a 32-bit Windows operating system (Windows 95 or later). Following are output types that will be removed in a future release of MadCap Flare. It is recommended that you use HTML5 instead of these. 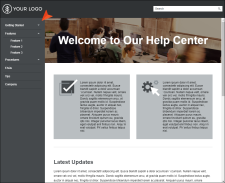 WebHelp is a Web-based Help format that can run on almost any browser or platform. 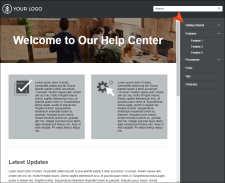 You can use WebHelp to create online documentation for the Internet or an intranet, as well as for desktop applications. The WebHelp output consists of a collection of files that you will distribute to users. The output will be displayed in the user's Internet browser window. The main entry file has an .htm extension. Multiple Browsers This format is a good choice if your users have different Internet browsers on their systems. Multiple Languages You can produce an output interface in various languages. This is possible through the use of language skins. Multiple Platforms This format is a good choice if your users are working on different platforms (operating systems). Web-Based This format is a good choice if you are writing online documentation for distribution on the Internet or an intranet. Sitemap/Search Engine Optimization (SEO) For web-based targets, you can generate a sitemap when compiling your output. This helps with search engine optimization (SEO), making it easier for search indexing services (i.e., spiders, crawlers, or bots) to find your output. Therefore, the entire output is indexed and search engine results are improved. See Generating Sitemaps for Search Engine Optimization. Note: The following browsers are supported for WebHelp: Internet Explorer 7.0 or later, Firefox 3.5 or later, Safari 4.0 or later, Google Chrome, and other browsers that support scripts and framesets. 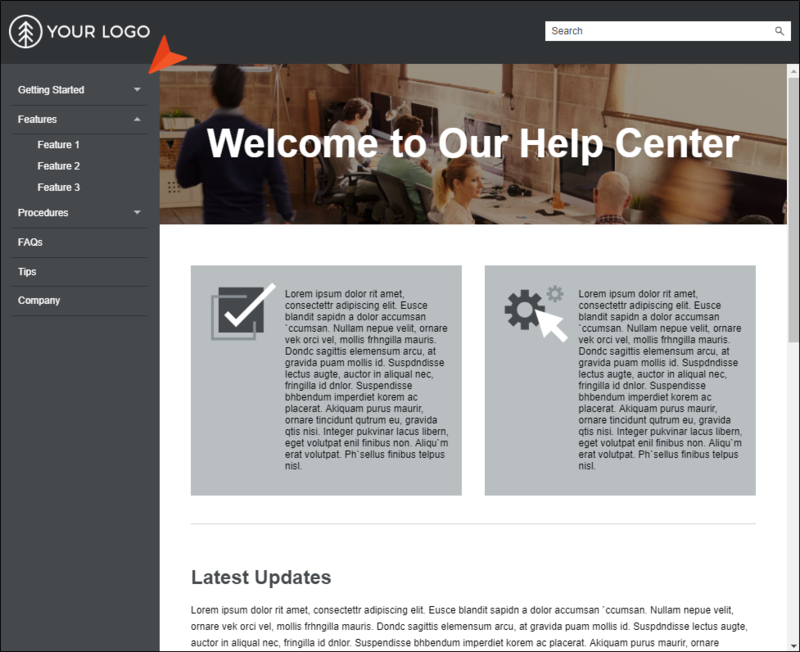 WebHelp Plus is a Web-based Help format that is identical to the regular WebHelp output in most ways. However, WebHelp Plus is designed to work on a Web server running Windows 8, Windows 7, Windows Server 2012, Windows Server 2008 R2, Windows Server 2008, or Windows Server 2003. It also uses Microsoft Internet Information Services (IIS) and ASP.NET. To provide faster search, WebHelp Plus uses Microsoft Indexing Service or Windows Search. The benefit of publishing WebHelp Plus output is that you and your users can take advantage of some advanced features, including searching of non-XHTML content, faster server-side search, and automatic runtime merging. The output consists of a collection of files that you will distribute to users by publishing output to a Microsoft IIS web server. The output will be displayed in the user's Internet browser window. The main entry file has an .htm extension. Following are some of the key features of the WebHelp Plus format. 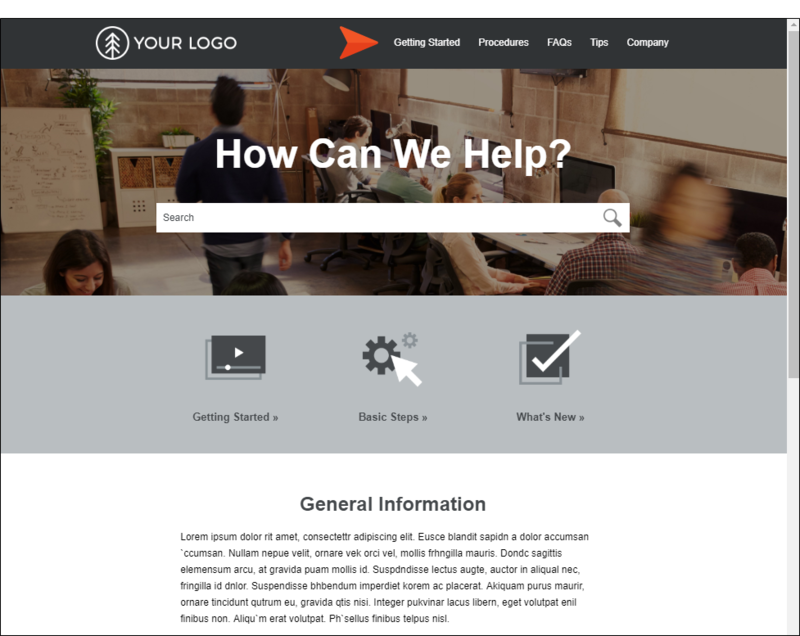 WebHelp Features This format lets you take advantage of features and benefits available with the regular WebHelp output type. Multiple Platforms This format is a good choice if you publish your output to a machine running Windows Server 2003, Windows Server 2008, or Windows 7. Searching of Non-XHTML Content When end users perform a search in your online output, you can ensure that non-XHTML files (e.g. PDF, DOC, XLS) are included in that search.When you build WebHelp Plus or HTML5 server-based output, a subfolder named "AutoSearch" is created and placed in the generated output folder. You can place non-XHTML files within the published AutoSearch subfolder (whether the non-XHTML files are linked to content from your Flare project or not). When users perform a search, those non-XHTML files will also be accessible to the users. See Including Non-XHTML Files in WebHelp Plus Search. Faster Searching Another benefit of generating and publishing WebHelp Plus or HTML5 server-based output to a web server running Microsoft IIS is that users will find the task of performing a search to be much faster than it is otherwise. This is especially useful if you have a very large Help system. Automatic Runtime Merging of Flare Projects This is an easy way to merge the output from multiple WebHelp Plus or HTML5 server-based Flare targets into one Help system. These targets can be originated from the same Flare project or from different Flare projects. You simply place the output files in the correct location on the server (i.e., within your master project's AutoMerge folder). Flare then automatically merges the output from all of the targets when users access the Help. From the end user's perspective, the results are seamless, appearing as one large Help system. All of the TOCs, browse sequences, indexes, glossaries, and search capabilities for the projects are merged. See Runtime Merging Output Using WebHelp Plus. 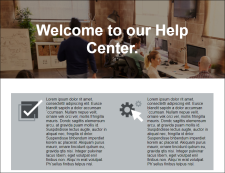 Note: If you want to test WebHelp Plus on your local computer, the advanced search features of WebHelp Plus are not operable. Note: The following browsers are supported for WebHelp Plus: Internet Explorer 7.0 or later, Firefox 3.5 or later, Safari 4.0 or later, Google Chrome, and other browsers that support scripts and framesets. Following are tables that show the various output types available, with the distinguishing features of each. Note: If an item does not have a check mark, that does not necessarily mean the feature is unavailable in the output. Rather, it means that the feature cannot be added in Flare. For example, search cannot be added in Flare for EPUB output, but some ebook readers may have search built in. 1It is possible to use autonumbering in online outputs, but only in a limited way. For example, if you have notes throughout your project, you can create an autonumber format on a paragraph style class that simply has the text "Note:" followed by a space. Then whenever you want to apply that style class to note content, it will automatically start with "Note:" so that you don't have to type it each time. However, in the traditional sense where autonumbering is used to increment numbers for elements such as chapters, figures, and tables, it is really only intended for print-based outputs. If you are creating both online and print output and want the autonumbering to be used only for content in the print output, you can use a print medium to specify the autonumbering settings for the print output. See About Mediums and Media Queries, Creating Mediums, and Styles for Print Output. 2In most cases, browse sequences are generated via a skin. This method is supported in HTML5 Tripane output, but not in HTML5 Side Navigation, Top Navigation, or skinless output. However, another way to use a browse sequence is by associating it with a menu proxy. With this method, browse sequences are supported in all HTML5 output formats. 4In HTML5, the proxies and related skin components for search bars and search results are supported only in Side Navigation, Top Navigatino, and skinless outputs. They are not supported in Tripane output. 1For most online outputs, creating a glossary via a skin is the preferred method. However, it is possible to use a proxy to include glossaries in these outputs as well. 1For Clean XHTML output, thumbnail images that are set as popups are converted to linked thumbnail images (i.e., the enlarged image opens in a new window instead of in a popup). 1For online outputs, creating an index is typically done via a skin. By default, the MadCap style that controls index proxies is set to support only print-based outputs. However, you can change this. To do so, open your stylesheet, select the MadCap|indexProxy style, and set the mc-output-support property to all (all-print is the default setting). By doing this, you can use the index proxy method to generate an index in some online outputs as well. 1This is controlled on the UI Text tab in a regular HTML5 skin. 2This is controlled in a language skin. 3As an alternative to using language skins, you can use the UI Text tab in the Skin Editor to perform all of the localization tasks for HTML5 targets. Be aware that translations in the Skin Editor are prioritized over translations in a language skin, so you should try to perform your localization tasks in one place to avoid conflicts. 1 Flare's HTML5 Side and Top Navigation skins do not support project merging. 2 HTML5 outputs do not support pre-merging. 1For online outputs, footnotes are converted to popups. 2This is supported only if you are using Elasticsearch or MadCap Search, but not Google Search. See Setting Up a Search Engine. 3If you publish output to Zendesk, you should use HTML5 skinless output, instead of HTML5 Side Navigation, Top Navigation, or Tripane outputs. 1EPUB support for each element or file type depends on if a particular reader supports it. 2PDF support for 3D Models requires Adobe Reader 7.0+. 3For this output, the 3D Model opens in a separate window. 4To view HTML5 movie output, end users must have a newer browser that supports these types of videos. 5This file format does not work in Internet Explorer. 6If you generate Microsoft HTML Help, YouTube videos are rendered smaller than in other outputs and Vimeo Advanced settings are not supported. However, you can make it work by adding the default meta tag to your target: <meta http-equiv="X-UA-Compatible" content="IE=Edge" />. See Adding Custom Meta Tags.